The cracks formed above Columbia Asphalt and Gravel’s quarry while the hillside moves at an average of 1.4 feet per week. Residents living below have not heeded evacuation warnings. 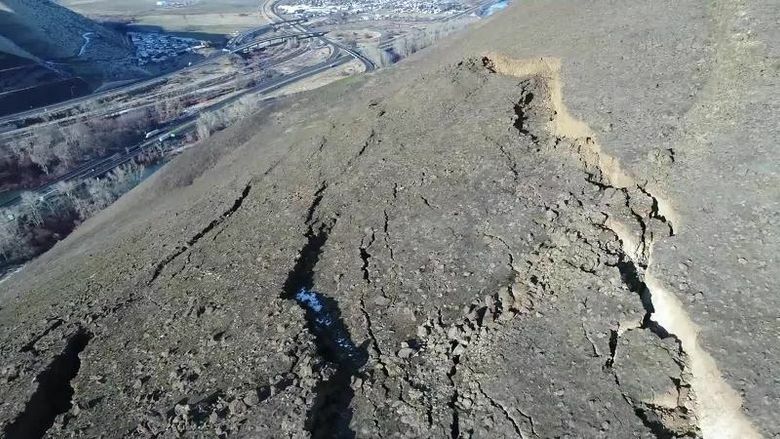 Yakima County officials said they can’t definitively predict the scope of an expected landslide on Rattlesnake Ridge, where massive cracks have opened several hundred feet above the road. However, officials said a landslide could be limited in scale. Geologists have been monitoring the slow-motion movement of soil in the area since October. “The geologic experts that have been monitoring this slide believe that since the slide is slow moving and on a gentle slope that the landslide event will be small in nature and hopefully stabilize itself,” the Yakima County Office of Emergency Management said in a statement issued Tuesday. Meanwhile, about 35 of the 50 or so residents living in a collection of trailers and modest buildings at the base of the ridge have not heeded warnings to evacuate. Under state law residents can’t be forced to leave, but the county’s emergency-management office is collecting their information to provide to first-responders should anything happen, said Horace Ward, the agency’s senior planner. Columbia Asphalt and Gravel, whose quarry is at one end of the crack, plans to offer residents hotel rooms if they want to evacuate, Ward said. Officials say the hillside above the quarry is moving an average of 1.4 feet per week, and that no significant movement has been observed. But Ward said the residents were warned to evacuate because officials say “something could happen” in the coming weeks. The Rattlesnake Ridge forms the eastern side of a gap in ridges separating the Upper and Lower Yakima valleys. Running through the gap are Thorp Road, Interstate 82, the Yakima River, a Burlington Northern rail line and Highway 97. The state Department of Transportation is watching for any rocks that might fall on Interstate 82 and has said it will close the highway if rockfall becomes a danger. In the meantime, the department has placed signs on the interstate warning drivers that rockfall is a potential danger, the release said. Thorp Road between Birchfield and Gangl roads will remain closed until further notice.